The Republic of Madagascar (older name Malagasy Republic) is an island country located in the Indian Ocean off the southeastern coast of Africa. 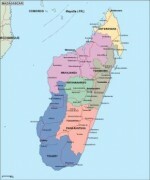 The nation comprises the island of Madagascar (at 587,041 square kilometres, the fourth-largest island in the world), as well as numerous smaller peripheral islands, the largest of which include Nosy Be and Nosy Boraha (Île Sainte-Marie). The island of Madagascar can be divided into three broad geographic zones. 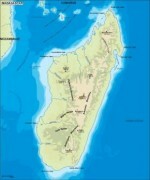 These include the highlands, a plateau region in the center of the island ranging in altitude from 750 to 1,400 m above sea level; a narrow and steep escarpment that runs the length of the eastern coast and contains much of the island’s remaining tropical rain forest; and a wide, dry plain that gently slopes from the western boundaries of the highlands toward the Mozambique Channel. 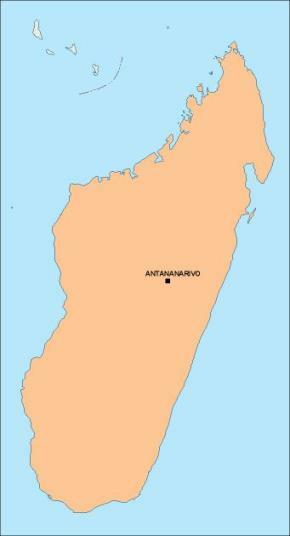 The central highlands, traditionally the homeland of the Merina people (the island’s most numerous ethnic group) and location of their historic capital at Antananarivo, is the most densely populated part of the island and is characterized by terraced, rice-growing valleys lying between grassy, deforested hills. 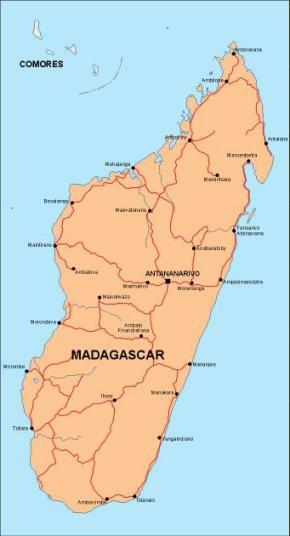 Madagascar’s highest peaks arise from three prominent highland massifs: Maromokotro (2,876 m) in the Tsaratanana Massif is the island’s highest point, followed by Boby Peak (2,658 m) in the Andringitra Massif and Tsiafajavona (2,643 m) in the Ankaratra Massif. To the east, the Canal des Pangalanes is a chain of man-made and natural lakes connected by French-built canals just inland from the east coast, running parallel to it for some 595 km. The western and southern sides, which lie in the rain shadow of the central highlands, are home to tropical dry forests, thorn forests, and deserts and xeric shrublands. 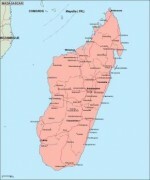 Due to relatively lower population densities, Madagascar’s dry deciduous rain forest has been better preserved than the eastern rain forests or the original woodlands of the high central plateau. The western coast features many protected harbors, but silting is a major problem caused by sediment from the high levels of inland erosion carried by rivers crossing the vast western plains.